4. Coat pan with cooking spray. Heat a saucepan to medium-high heat. Add chicken to pan; sprinkle with 1/8 teaspoon salt and 1/8 teaspoon pepper. Cook 5 minutes or until browned, turning occasionally; remove from pan. 5. Add remaining 1 tablespoon oil to pan; swirl to coat. Add onion and garlic; sauté 5 minutes. Combine milk and flour, stirring with a whisk. Add milk mixture, stock, remaining 3/8 teaspoon salt, and remaining 3/8 teaspoon pepper to pan. Bring to a boil, stirring frequently; cook 2 minutes or until thickened. Remove from heat; cool slightly. Add Parmesan, stirring until cheese melts. Stir in quinoa, broccoli, chicken, and Greek yogurt. Spoon mixture into a 2-quart glass or ceramic baking dish coated with cooking spray. Sprinkle with cheddar. 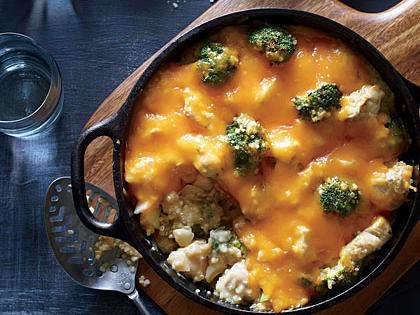 Bake at 400° for 15 minutes or until casserole is bubbly and cheese melts.